Home Memoir or Autobiography What Qualities Make a Good Memoir? There is a wide range of topics and styles in memoir writing. So to answer the question “What qualities make a good memoir?”, I decided to read customer reviews on a bunch of memoirs on Amazon. I noted adjectives that were commonly used throughout the reviews. It was actually surprising to find the same words and phrases used to describe wildly different memoirs. I wasn’t sure when I started how easy it would be to identify qualities that make a good memoir, but I think this is a pretty terrific list. As you think about writing your own memoir (or autobiography), ask yourself if and how you can incorporate each of these qualities. 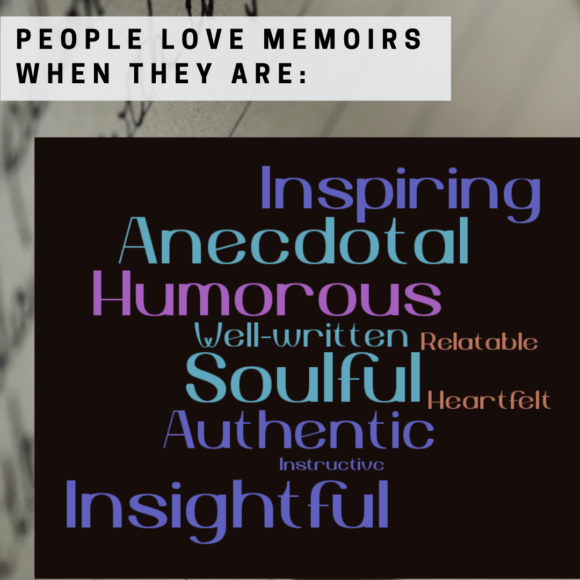 Your memoir doesn’t necessarily need to be all of these things, but I think the more, the better. In the process of learning what qualities make a good memoir, I also learned a little about what qualities don’t make a good memoir. Understandably, some of the negative terms that were used were simply the other side of some on the good list. However, most stand on their own. Just a note on “depressing”… If you’re writing about a heavy subject, there may be depressing parts or even an unhappy ending. Most readers are okay with that as long as there is something instructional or insightful to go with it. Here’s one takeaway… Be humble, be vulnerable, and take your readers inside your journey. Does this list help you? What qualities do you think make a good memoir? Share your thoughts below!